Bowls - Wilkinson Sword Merit Final at Luddendenfoot BC. Richard Helliwell. 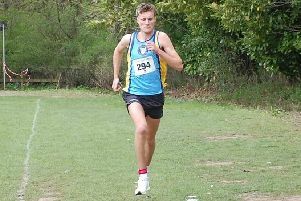 Richard Helliwell won the Halifax League’s Briggs Priestley Merit at Luddenden Foot on Sunday. He defeated defending champion Mark Regan by 21-4 to claim the Wilkinson Sword Trophy for a second time. Helliwell, whose first success was in 1988, opened with a 21-10 victory over David Hemsley. He then faced a quarter-final against last week’s Halifax Association Merit winner Martin Steele. Helliwell trailed 1-4 but then pulled away to lead by 15-6. Steele narrowed the gap to 12-15 but Helliwell won back the jack and went on to win by 21-17. In his semi-final , against Gareth Nicholson, Helliwell began well to lead by 9-3. Nicholson fought back to level at 10 but Helliwell regained control to win by 21-13. Regan began with a 21-10 victory over Keith Hatzer before a 21-7 quarter-final victory over Mark Barnett. In his semi-final, against Ashley Southwell, he opened with a break of eight. Southwell was only one point adrift at 9-10 but he was unable to maintain his challenge and Regan went on to win by 21-12. In the final, Helliwell dominated from the start. He led by 3-1 before surging ahead with a break of nine to lead by12-1, and finished with break of six to win by 21-4. First round scores: I. Ryding 3 M. Steele 21; R. Helliwell 21 D.Hemsley 10; K. Bannister 6 J. Hamer 21; J. Watters 10 G. Nicholson 21; P. Gill 13 A. Southwell 21; J. Halliday abs P.Evetts w/o; G. McCafferty inj M. Barnett bye; M. Regan 21 K.Hatzer 10.